This MUST HAVE Cruise Accessory will triple the available outlets in your Cruise Cabin. You'll find most cabins have only two available wall outlets! BUT you have cell phones, iPads, laptops, cameras, and many other devices that need charging. Our Travel Power Strip is the solution. IMPORTANT: Cruise lines require that power strips DO NOT have Surge Protection and many prohibit Extension Cords. Our model was made specifically to adhere to these rules so it's fully cruise compliant. 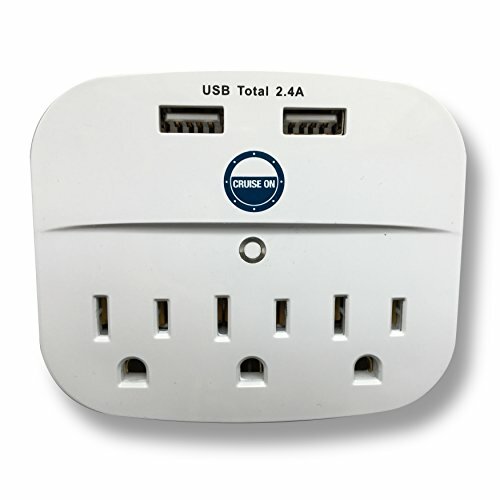 It is the only cruise-specific Non Surge Protected Travel Power Strip you'll find to comply! Your Travel Power Strip takes up very little packing space and easily fits into the palm of your hand. It's three-prong plug fits into the top socket so as to keep the lower one free to use. The two USB outlets and three, 3-prong sockets are perfect for all of your electrical items. Don't get stuck in your cruise cabin waiting around for your devices to charge. It's a LONG walk to and from the ship. Make sure all of your devices stay charged and ready. When you return home from your cruise, the device will continue to serve as a great value to provide extra power to those areas in your house with few outlets. The product is made from the #1 Cruise Accessory brand, CRUISE ON, and satisfaction is guaranteed. If you're not happy with your Travel Power Strip for any reason, we'll be happy to offer a full refund! If you have any questions about this product by Cruise On, contact us by completing and submitting the form below. If you are looking for a specif part number, please include it with your message.